Heat rash or miliaria, also referred to as sweat rash or prickly heat, typically occurs in hot and humid conditions or during the summer season. Although it can affect people of any age, it is more commonly seen in infants and children, probably owing to the fact that their sweat glands are still not fully developed at this age. 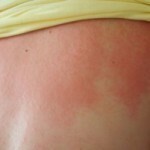 Heat rashes may occur due to excessive heat from high environmental temperatures, overly warm clothing or due to fever. 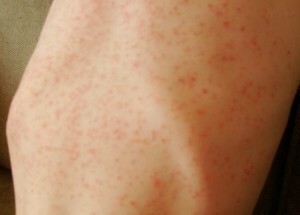 Most parents believe that any rash exhibited on their child’s skin is likely to be a heat rash. However, there are several conditions and other triggers that may cause a child to develop a rash. These include eczema, impetigo and poison ivy. Depending on the cause of the rash, different methods may be needed to treat the bothersome symptoms of any rash. It is therefore important that you ensure that what you are treating is indeed a heat rash. Heat rashes, though common in infancy, may still occur in adulthood. This usually manifests during activities that cause an excessive build up of heat and sweat or from wearing clothes that fit too tightly that do not allow fresh, cool air to circulate between the skin and clothing. There are ways to prevent and get rid of a heat rash. In most cases you will not need to see a doctor and you may need to use simple home remedies to conquer the nuisance. However, if you have any rash for a prolonged period of time, this may be caused by another underlying condition that may need to be assessed by your doctor. If the condition is not too intense, the following home remedies maybe used to provide some relief from the discomfort caused by heat rashes. It is suggested that anyone with a heat rash, ought to cool off for a few days. This means reducing your contact with very hot, humid conditions. If you are able to stay in an environment with an air conditioner or one that is well ventilated to allow good circulation of cooler air, you should realize that there is a lessening of visible bumps associated with the rash. However, if you work outdoors or live in a hotter environment, then this option is less likely to be feasible. Wear cotton or other breathable fabrics this will keep your skin cooler and prevent the associated warm and moist conditions from triggering a heat rash. It is also wise to wear loose fitting clothing to increase the effect of the lighter, more skin friendly fabric(s). Do not bathe with a harsh soap as this will aggravate the heat rash and cause it to worsen. Use gentle soothing soaps that contain very little chemicals. Try using a glycerine bar that will have far less irritants. Do not use certain types of ointments or moisturizers that may block the pores and provide a suitable environment for the rash to spread. If you must use any moisturizer, be sure that they are noncomedogenic and do not clog the sweat ducts. You may also use calamine lotion or one that contains dimethicone, as these help in reducing itching. These lotions are fairly easy to obtain and will help lessen the associated symptoms. You could apply the gel of aloe vera on the affected areas. This will aid in soothing the rash and will also help to speed up the healing process. You may use powders to keep yourself more sweat resistant and cooler. Use a medicated powder that has been designed for this purpose. After any activity that induces sweating, wash yourself thoroughly with a mild soap and sufficient amount of water. You could try using ice to combat the discomfort caused by the rash. Put some ice inside a plastic bag and wrap it in a clean cloth. Apply it to the affects areas and keep it there for 5-10 minutes. This can be repeated every 4-6 hours. The above mentioned home remedies can be used to help soothe your skin from the discomfort and irritation caused by heat rash. However, if the condition persists or worsens, it is best to consult a professional medical practitioner.